Der Artikel Endeavour Season 1-6 (UK Import) wurde in den Warenkorb gelegt. Thriller / TV-Serie, 3240 Min. All the episodes from the first six series of the feature-length spin-off of ITV's long-running crime drama 'Inspector Morse'. 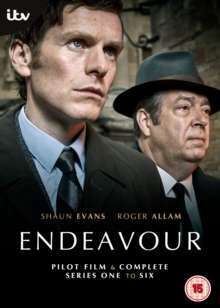 Set in 1965, the show follows Endeavour Morse (Shaun Evans) in his younger years as a police constable. Working alongside his senior partner Detective Inspector Fred Thursday (Roger Allam) and PC James Strange (Sean Rigby), Morse engages in a number of investigations around Oxford, England.